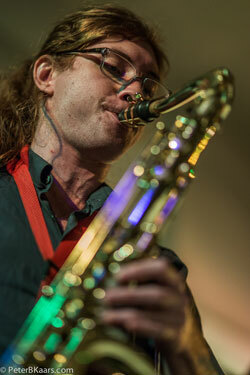 Joshua Marshall is an Oakland-based saxophonist and composer/improviser. His work involves architectural innovation, narrativity, systematic improvisatory practice, and live digital media. He has studied with Roscoe Mitchell, Fred Frith, Pauline Oliveros, Evan Parker, Zeena Parkins, Butch Rovan, I.M. Harjito, and Steve Adams of the ROVA Saxophone Quartet. Joshua has played and/or recorded with Opera Wolf, The Lords of Outland, Architect/Enchantress, Bill Noertker's Moxie, Medium Sized Band, ELL3, Cheer Accident, Josh Allen's Deconstruction Orchestra, Key West, Mister Sister, Ikue Mori, Robocop, the Andrew Weathers Ensemble, Modest Machine, and MDK. His music has been featured in festivals and conferences nationwide, including Providence Pixilerations events, the 2010 International Computer Music Conference and 2013's Outsound Summit. Joshua graduated from Brown University, earning a B.A. through the MEME program, and holds an M.F.A. in music from Mills College.